The warehouse has large Loading and Unloading Bay, Receiving Area, Raw, Packaging and Finished goods store, Sampling Area, Office for Logistics activity and lockers for warehouse personnel. The ware house is connected with the production building by a dedicated corridor. 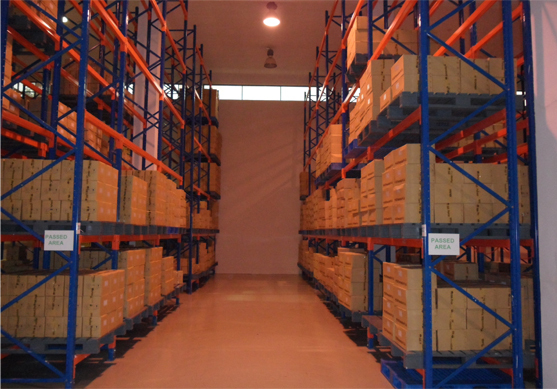 Warehouse is air conditioned to <250 C. There is a AC Store in the warehouse, capable of operating at temperature as low as 80 C. Goods in warehouse areas are stored on pallets held in pallet racking. The status of goods & products is controlled by labels, which can only be applied by QA personnel. FIFO is used for dispatches.